crucial to good bread. 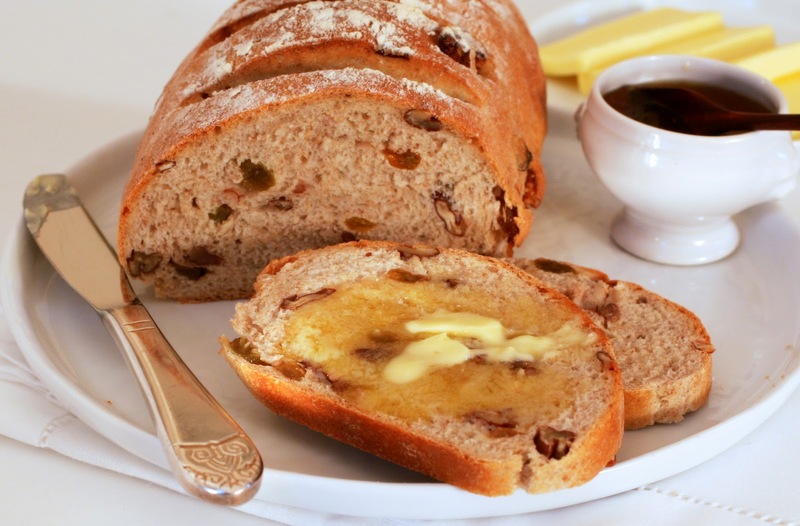 This time I made Hadjandreou’s Pecan Raisin Bread, which contains a small amount of whole wheat flour along with chopped pecans and golden raisins. A little crushed fennel seed would also be a welcome addition, I think. The bread is delicious, with a beautiful crust and slightly sweet and nutty flavor. I soon realized that the small loaf the recipe yields was just not enough. It can easily be doubled, though, so I suggest you make yourself two small loaves. 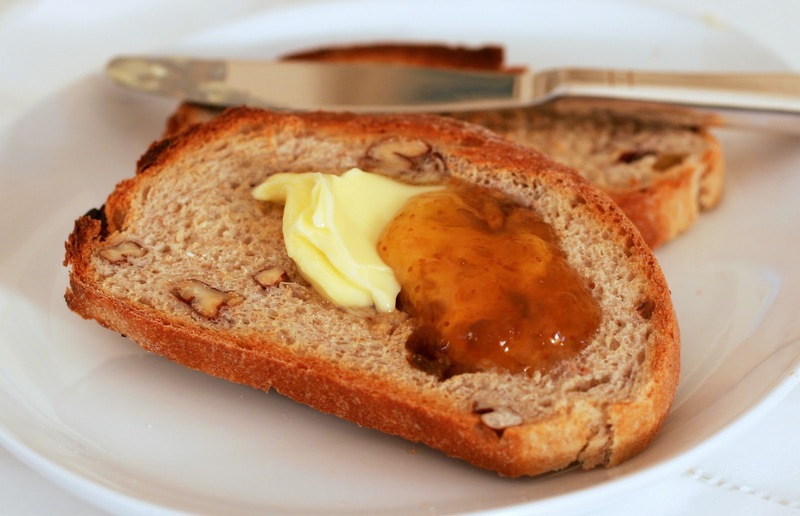 It’s also great toasted, slathered with European butter and a little spoonful of fig preserves. 1. 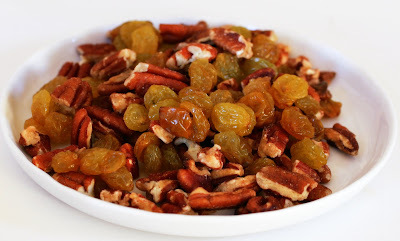 In a bowl, mix together the pecans and raisins and set aside. 2. In a mixing bowl, mix together the flours and salt. 3. In a large mixing bowl, combine the yeast and water, stirring to dissolve the yeast. Add the dry mixture to the wet mixture, stirring with a wooden spoon and then with your hands until the mixture forms a dough. Cover and let stand for 10 minutes. 4. Add the pecan mixture to the dough and knead in the bowl by pulling a portion of the dough up from the side and pressing it into the middle. Turn the bowl slightly and repeat this process with another portion of the dough. Repeat another 8 times. Cover the bowl again and let stand for 10 minutes. 5. 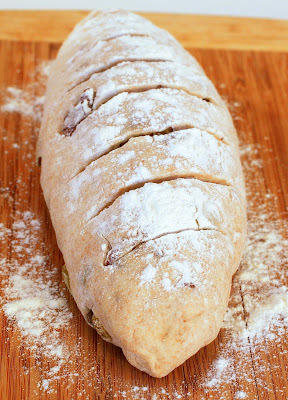 Repeat the kneading and standing twice, then knead the dough once more, cover and let it stand for 1 hour. 6. When the dough has doubled in volume, punch it down to release the air. Lightly dust a work surface. 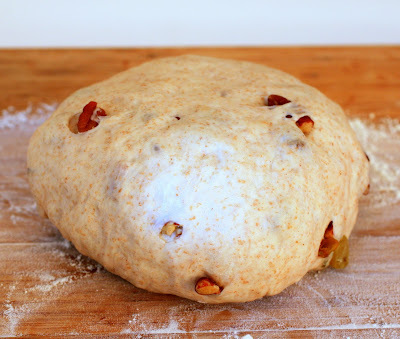 Transfer the dough to the work surface and fold one edge of the dough over into the middle. Fold the opposite edge over to the middle. Now roll the dough to make a sausage shape, making the ends tapered. 7. Sprinkle the flour over the bread. Score diagonal lines along the surface using a sharp, serrated knife. Place the loaf on a parchment paper-lined baking sheet. Cover with plastic wrap and let rise until slightly less than double in size, about 30 to 45 minutes. 8. About 20 minutes before baking, preheat the oven to 475°F. Place a roasting pan at the bottom of the oven to preheat. Fill a cup with water and set aside. 9. When the dough has risen, remove the plastic wrap. Place the bread in the oven and pour the cupful of water into the hot roasting pan. Lower the oven temperature to 400°F. Bake the bread for about 30 minutes, or until golden brown. Cool on a wire rack.